Enroll in direct deposit and have your payroll or government benefits checks deposited to your Card Account. Load $1,000 or more, per monthly billing cycle and we'll waive the $2.95 Monthly Fee. Use everywhere Debit Mastercard is accepted to shop or pay bills—even online. I have read and agree to the Consent to Electronic Disclosures. I have read and agree to the Cardholder Agreement, Fees and acknowledge receipt of the Privacy Policies. I understand that this is NOT a credit card, loan, or cash advance and I must deposit my own money before using my Exact Prepaid Mastercard. 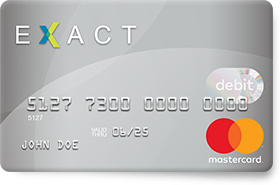 ‡In order to register this Card in California, you will need to consent to The Bankcorp Bank sharing, and authorize and instruct the Bancorp Bank to share information about you and activity on your account with Exact and its affiliates so that they can provide you with services, inform you about special offers and create and update their records. No Monthly Fee when $1,000 or more is loaded per month, otherwise, $2.95 per month.